WEST POINT—The annual Buffalo Soldiers Memorial Ceremony at West Point took place on Sept. 4 at Buffalo Soldier field. A wreath was placed at the memorial bronze plaque embedded in a rock. The event honored the last Buffalo Soldier to serve at West Point, Sgt. Sanders H. Matthews, who passed away days before at the age of 95. Maj. Gen. Fred A. Gorden, retired, presented an artist’s rendering of what a proposed one and a half-size bronze memorial sculpture would look like. The memorial was designed by renowned memorial sculptor Eddie Dixon. President of the West Point chapter of the club, Melvin Smith, said the memorial represents a significant part of the history of Buffalo Soldiers, which Congress formed at the end of the Civil War to give a job to thousands of displaced black soldiers and ex-slaves. Three infantry units and two cavalry units of black soldiers were assigned to help tame the West for the settlers moving there. Native Americans were the first to call them Buffalo Soldiers for their grit and courage in battle. At West Point, in 1907 a detachment of the 9th Cavalry was charged with horseback instruction and drill of cadets. In 1937 it was replaced by a squad from the 10th Cavalry, who served at West Point until 1947. 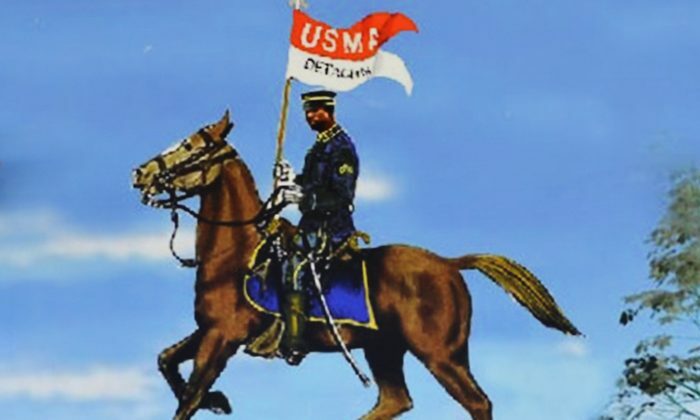 The Buffalo Soldiers were considered to have the best riding skills in the army. Butler served in the navy in Korea and as a Tuskegee airman. “They shouldn’t forget what the Buffalo Soldiers did here at this post,” he said. At the ceremony Lt. Col. Frederick Black introduced West Point Superintendent Lt. Gen. Robert Caslen, Jr. who gave the keynote address. Caslen noted this was the 150th anniversary of the Buffalo Soldiers military formation. Buffalo Soldiers were among the first riders of the Pony Express and served as the first park rangers in national parks. Caslen noted that 23 Buffalo Soldiers received the Congressional Medal of Honor in military conflicts. He gave a long list of African Americans who graduated from West Point, including Gen. Colin Powell, former chairman of the joint chiefs of staff and former secretary of state. The superintendent then announced the design of the new bronze memorial to the Buffalo Soldiers that he hoped would inspire future generations of West Point graduates. Caslen, Black, and Connor Matthews placed the wreath at the memorial rock. A group of West Point cadets stood at attention and were joined by ROTC units at two nearby high schools. Gorden, the first black Commandant of Cadets at West Point, said the large memorial sculpture has been in the works since 2008. He calls the project “transforming the rock” that is now embedded with the plaque. Gorden said much time and effort was put in the sculpture’s historical and military accuracy. “It involves the proper accoutrements such as the saber and the saddle, the leggings.” The guidon, or military emblem, on the hat was just one of the items that had to be historically vetted, he said. The base of the memorial will incorporate the memorial rock. One image shows the 9th Cavalry with West Point graduate and U.S. President Dwight D. Eisenhower. Matthews was a Buffalo Soldier in the 10th Cavalry in 1939 when he was first stationed at West Point. He served as the first black police officer in the Village of Highland Falls and later returned to West Point driving cadets to cultural and sporting events. Eddie Dixon‘s first commission was for the Smithsonian Institution and the sculptor became known for the authentic detail in his works. He is presently completing a bust of Gen. Colin Powell.